There is just something about cozies. Even if it is not one where the setting is a bakery or a coffee shop. Even if it is not a cozy that has recipes at the end. Cozies just mention food. Frequently regional favorites. To give the reader a sense of place, I suppose. This past week I discovered Pimento Cheese Sandwiches and Fried Green Tomatoes Caprese. I had never heard of pimento cheese so you know I had to Google it. Well then I had to make it. I did a cross between Craig Claiborne’s recipe and Paula Dean’s. It is soooooooooo good. But I will be eating the sandwiches for days. Because one was sufficient for my husband and I do not throw away food. Only make a batch if you are having a party or you have a large family. Since moving into the condo, I no longer have a garden so I am at a loss as to where to get green tomatoes. They don’t sell them in the store. This is going to take a trip to a farm and telling the farmer I want green tomatoes, not ripe ones. 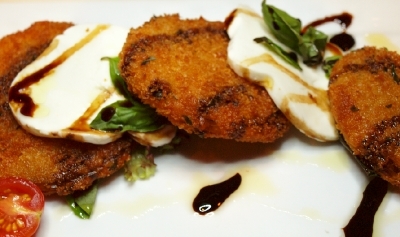 Because I love a Caprese salad and I love fried green tomatoes so I have to try the combination. And you just cannot read a Cleo Coyle mystery without trying some of her recipes. And it is not just the food with her, it is the coffee. You can almost smell it. I had to go out and buy myself a French Press and a coffee grinder. 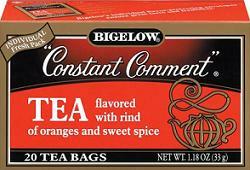 And I think it was in Vicki Doudera’s last mystery (about a real estate agent) someone was constantly drinking Constant Comment Tea. Of course I had to go out and get some. Immediately. Loved it. Obviously I am very suggestible so I’m just glad someone doesn’t write a cheesecake mystery series. Richard Simmons would have to come and do an intervention. Um… No one does write a series about someone who bakes cheesecakes, do they? If like me, you love culinary themed cozies, you can find lots more at Cozy Mystery List which is where the list I have below comes from. It is also one of the most useful resources for finding all kinds of cozies if you haven’t already discovered it. Besides listing cozies alphabetically by author, you can find them by theme, region, occupation and all sorts of other breakdowns. Cozy Mystery Authors with Culinary Themes: S – W Plus Some! Cozy Mystery Authors with Culinary Themes: Even More! Have to love them! There’s nothing like a cozy and a cookie, bad for the waistline! Constant Comment and a cozy is the perfect combination for a cool rainy day. Food cozies are my favorite kind of cozies!! I agree with you, the Cozy Mystery List is my favorite site to find more Cozies! !